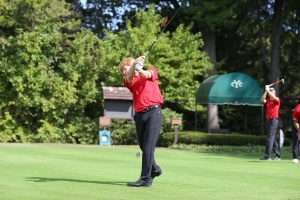 CJ Hughes was a huge part of the Youngstown State University men’s golf team’s success throughout the year. Both the men’s and women’s golf teams at Youngstown State University had their fun at the Horizon League Championships down in Howey-in-the-Hills, Fla.
On the guys’ side, freshman Kevin Scherr finished in sixth place to lead the YSU men’s golf at the Horizon League Championships at the El Campeon Golf Course. 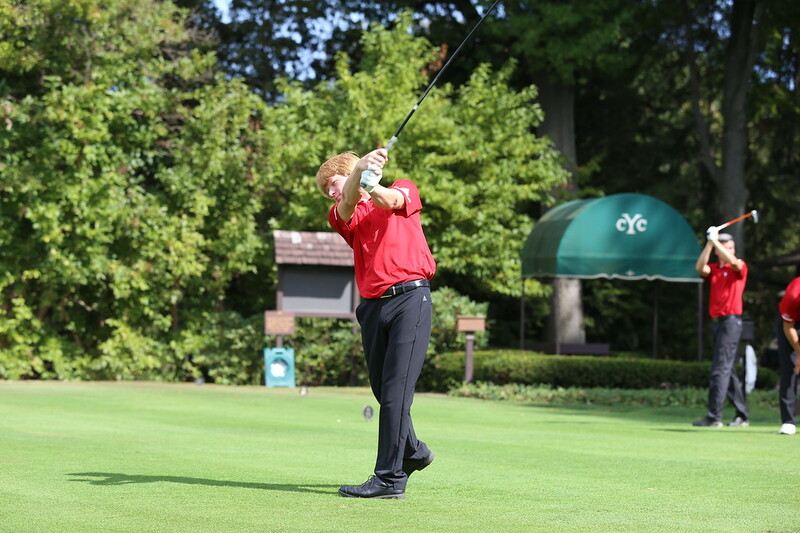 Scherr had a three-round total of 224 that featured consistent rounds of 73, 75 and 76. In his final round 76, he had 13 pars and five bogeys. On the final nine holes, he was two-over-par. Strong play on the back nine throughout the tournament lifted Scherr to his top-10 finish. In the three rounds he combined to go two-over-par on the final nine holes. From No. 8 through 18, he was just one-over-par for the event. Junior Jason McQuown finished with a three-round total of 235 to finish 24th after a final round 77. For his third round, he had birdies at No. 1, No. 14 and No. 16. Freshman Ken Keller posted a final round score of 77 to end his first tournament appearance on a high note. For his round, he had 12 pars and six bogeys. He parred his final five holes of the round. Freshman C.J. Hughes finished with a three-day score of 247 following a final round 83 on Tuesday. Hughes’ round was highlighted by a birdie on the par-5 10th hole. Senior Justin Hallapy carded a 248 for the tournament after a final round 86. 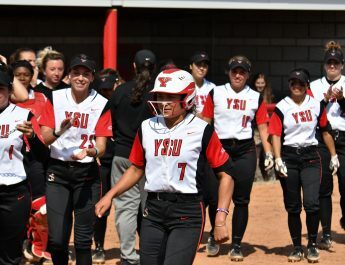 In the team standings, YSU finished seventh with a three-round total of 938. The Penguins had a score of 313 on Tuesday. YSU’s Katlyn Shutt had a solid final round to finish in the top-10 while her sister, Courtney Shutt, capped off her Penguins career on a high note as the Horizon League Women’s Golf Championships concluded on Tuesday at the Las Colinas Golf Course also in Howey-in-the-Hills, Fla.
Katlyn Shutt had a one-over-par 74 for her final round on Tuesday to improve six spots in the final standings. Shutt posted a three-round total of 237 to finish in eighth place. She was in a groove on Tuesday posting 14 pars, two birdies, a bogey and a double bogey. After a bogey on the first hole, she parred 13 of the next 14 holes. The only non-par was a birdie on the par-4 sixth hole. A double bogey at No. 16 halted her run, but she rebounded to par the 17th and birdied the 18th to finish her round. Courtney Shutt, a senior, concluded the tournament with her best round carding an 82. She played her final 10 holes at one-over-par to finish her career strong. On the back-nine she had six pars, two bogeys and a birdie at the par-5 14th. In the individual standings, she placed 36th with a 257. Freshman Tori Utrup had a final round 83, her best of the tournament, to finish 25th with a three-round total of 252. In her final round, Utrup had a birdie on the par-4 ninth hole. Megan Creager and Kara Raines each finished with a three-round total of 262 for the event. In their final rounds, Creager shot an 86 while Raines carded an 87. Raines’ round was highlighted by a birdie on the par-4 ninth. In the team standings, the Penguins finished seventh with a three-round total of 1,003. YSU had its best round of the event on Tuesday finishing with a team score of 325. Congratulations to all the seniors that golfed in their final Horizon League Championships.